We went to the zoo today. 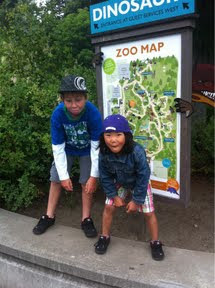 My son and daughter wanted to visit the monkeys. Seems to me we didn't need to, they already are monkeys. Not only that, they are constantly up to monkey business. They goof around like a couple of monkeys, sometimes I think they smell like monkeys, and yes, they look like monkeys too! Oh well, a little extra monkey exposure can't do any harm. We are enjoying some family time, before I fly off to North Carolina for a few days. Jesus, thank you for the gift of family. Thank you for blessing me. Thank you for putting little monkeys in my life! Say That Again, Jesus! You will bless me and You will love me!